Joshua Jantz, the long-shot Republican candidate facing state Sen. Andrew Rice in the Senate 46 District race, is using religious rhetoric again in his campaign material. As some of you may remember, Jantz ran against Rice in 2006. Rice, the Democratic nominee for the seat, which is in Oklahoma City, won 70 percent of the vote that year by the landslide margin of 7,342 to 3,217. 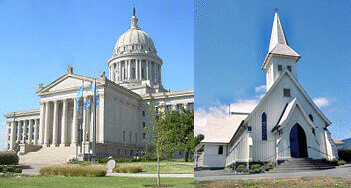 As part of his 2006 campaign, Jantz circulated campaign material, which thanked voters for praying “For God to place a hedge of thorns around the district, & every voter within, that no evil influence prevails, & that voters will know and believe the truth.” (Read the 2006 Okie Funk post about it here). “A hedge of thorns”? Is this supposed to be a figurative, unseen hedge or a real hedge circling the district and all of us individually? Ouch! Make sure the kids don’t get too close. Our friends and loved ones often fall short of being able to reach to the depths of fulfilling this need and longing in our lives. I find my greatest source of comfort and hope in spending time praying and reading the Bible, asking God to show me and reveal to me His peace, comfort, and guidance. I would be delighted to help you find this source as well. If I can ever pray with you please let me know. There’s nothing wrong with a candidate explaining his/her religious beliefs, of course, but this statement-and I believe it’s sincere-goes beyond description to proselytizing. It also brings up this question: Does Jantz really want to become a state Senator? Maybe, and I say this sincerely, he should become a full-time church minister instead and help people find “comfort and guidance” through the Bible. So do voters in District 46 want a religious proselytizer offering prayer time or a proactive and experienced, savvy state Senator with experience running for a major statewide office? It’s really no contest. Rice, the Senate’s minority leader, is the clear choice for the district. He serves as one of the state’s most articulate leaders in opposition to the ultra-conservative agenda here and deserves reelection by another landslide. You can get involved with the Rice campaign and/or contribute here.